Quick-Step’s Fernando Gaviria won his second stage of this Giro d’Italia as he sprinted to victory in Messina. The Colombian took advantage of an early sprint from Bora’s Sam Bennett to launch his own sprint and take the stage whilst the other sprinters struggled for position after a technical city circuit around Messina. Messina is where last year’s winner Vincenzo Nibali hails from but the parcours weren’t in favour of him today with the last 80km a flat run into the town followed by a fast, technical 6km circuit around it. The day began with a breakaway duo establishing themselves right from the drop of the flag with Evgeny Shalunov (Gazprom-Rusvelo) and Maciej Paterski (CCC) being allowed to go clear and quickly establish a lead of 2’30” after 8km of racing. The gap continued to go out but was never more than 4′ as Quick-Step and the other sprint teams were keen to keep them close with one eye on a sprint finish. The gap stayed around the same as the duo began the only categorised climb of that day at the category 4 Andronico Sant’Alfio with Shalunov taking full points at the top as the duo began the descent. Back in the peloton Teklehaimanot (Dimension Data) attacked the peloton at the summit to take the one remaining mountain point meaning he now trails classification leader Jan Polanc by 20 points after Polanc moved into the lead after his stage 4 victory. With 50km left to race the break’s advantage was still holding at around 3’30” but as the race turned onto the coast the sprint teams of Lotto-Soudal and Quick-Step placed riders at the front of the peloton to start bringing them back and 10km later the gap was down to 2’50”. The tailwind the race was experiencing pushed the average speeds up and at times the break was moving along at 55km/h, but the sprint teams in the peloton were forcing an even higher pace of around 60km/h which was eating away at the two leaders’ advantage and with 20km left to race the gap was down to just 1′. 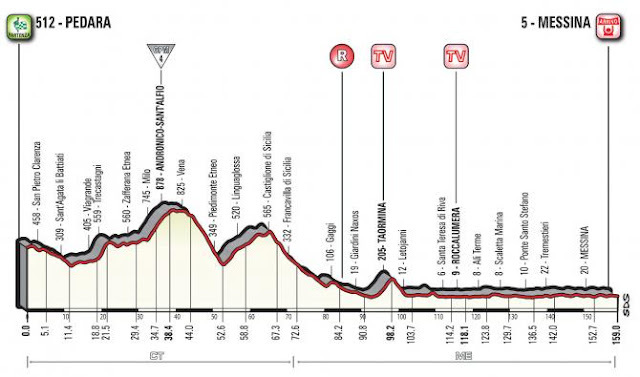 After a long day in the breakaway Shalunov and Paterski were caught with 15km to go as the sprint team of Bora-Hansgrohe took over the pacemaking for Sam Bennett with Orica-Scott helping for Caleb Ewan and Bahrain-Merida lining out for Vincenzo Nibali to make a cameo. The riders went through the finish line for the first time onto the short circuit around Messina with 6km to go with all the sprint teams lining out across the road to try and get the best position going into the sharp turns of the city circuit. Bora and Quick-Step were amongst the sprint teams who were all in contention with no one team controlling as they turned the final corner to begin the long, straight run to the line. As the peloton went under the flamme rouge Quick-Step took over at the front for Gaviria as Sam Bennett launched his sprint early to try and get the drop on the others. The pace was too high though and Bennett was soon brought back and used by Gaviria as a launchpad for his own sprint as he took the win. Andre Greipel and Caleb Ewan struggled to get good position in the sprint and Greipel could only manage 4th after a late surge with Ewan not featuring in the top ten.